These are the END TIMES and the Islamic Beast is Rising (Psa 83; Ezek 38-39; Dan 7-12; Rev 11-19). 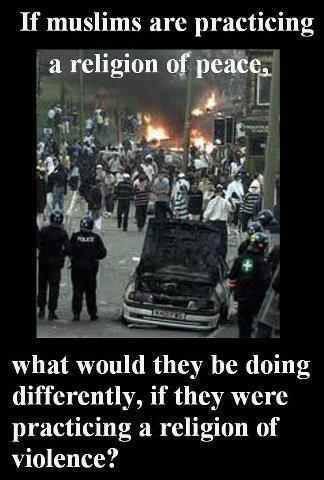 Those who see this and remain silent help facilitate the evil being perpetrated worldwide through the spread of Islam. Winston Churchill once remarked: “Most people, sometime in their lives, stumble across the truth. Most jump up, brush themselves off, and hurry on about their business as if nothing had happened.” I hope this won’t be your response to the Islamic caliphate now forming around the world that God called me to warn you about. Terrorists Among Us: Jihad in America, a 6 Part PBS documentary first aired nationwide in 1994, was produced by investigative reporter Steven Emerson after the first bombing of the World Trade Towers in 1993. The documentary was recently updated following terrorist attacks in the United States on September 11, 2001. In making this groundbreaking documentary, Emerson was the first American journalist to document in chilling video the militant Islamic support networks and terrorist groups secretly operating on American soil. Counter-terrorism officials from the National Security Council, Justice Department, Federal Bureau of Investigation (FBI) and the Central Intelligence Agency (CIA) have acknowledged that Emerson’s documentary demonstrated that he had more reliable and accurate information about the secret terrorist networks on American soil than the US Government . Emerson was successful in infiltrating key conferences and rallies with hidden cameras in an effort to track down the people responsible for supporting and abetting terrorist activities on U.S. soil. At these events, and on this film, these extremists state their chilling intentions in their own words. The film, then and now, has brought the attention of the U.S. government authorities to the network of Islamic extremists in the United States that promote a culture of hatred, arrange for training in bomb-making and target practice, raise funds for militant groups in the Middle East, and in some cases, support terrorist attacks on U.S. soil. The film tracks down and shows interviews with a network of Islamic extremists in New York, Boston, New Jersey, Texas, California, Florida and Kansas, detailing their hatred and violent intentions against all Americans, including Christians, moderate Muslims and Jews in the United States. Emerson emphasizes throughout the one-hour documentary that the majority of Muslims in the United States do not support terrorist activities. He also says that Islam, as a faith, condemns such acts of terrorism. Emerson also notes, that the Islamic extremists who promote and carry out Jihad, are as a great a threat to moderate Muslims as they are to Christians, Jews and all American citizens. The video is an educational call to action for the American public, to provide U.S. law enforcement authorities with the tools they need to deal with this real threat to the American way of life. By educating the public, the film suggests that effective preventative measures can then be taken. Suggestions by counter-terrorism experts throughout the video help us understand the scope of the threat and what needs to be done to protect U.S. citizens, while at the same time preserving civil liberties. Winston Churchill once remarked: “Most people, sometime in their lives, stumble across the truth. Most jump up, brush themselves off, and hurry on about their business as if nothing had happened.” I hope this won’t be your response to the Islamic caliphate now forming around the world that God called me to warn you about. Watchmen in Israel were appointed to sound the alarm to God’s people about impending danger (Isaiah 21:6). As God’s watchman, I see the greatest danger for America and the church is the Islamic Beast Rising while most in America and in the church are mesmerized by its propaganda and thus unwilling to say a word. Islam is couched as a “religion.” It is not. It is an Anti-Christ, Anti-Semitic Fascist political Beast intent on re-establishing the Byzantine caliphate that ruled one-thousand years after the collapse of Western Rome; all done by following the teachings from the Qu’ran and Sharia law that command Mooslims to slaughter all who won’t convert to Islam: “Fighting [which means “killing” in Arabic] is obligatory for you, though you dislike it.” [Sura 2:126]. “I shall cast terror into the hearts of the disbelievers. 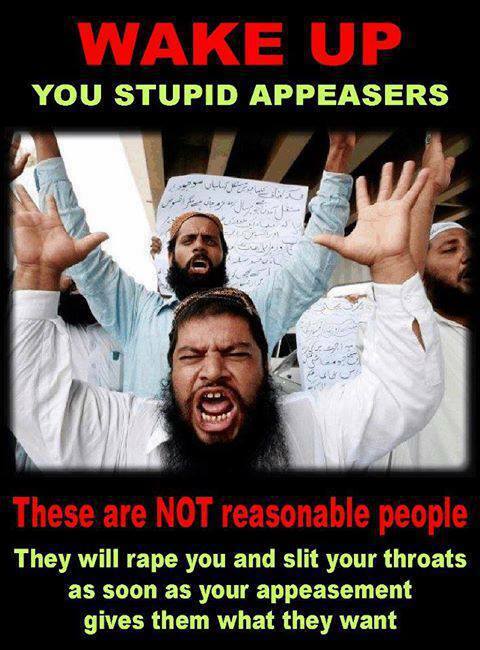 Cut off their heads, and cut off their limbs.” [Sura 8:12]. With the Qu’ran as its guide, and sharia as its goal, is it any wonder most of the violent uprisings around the world are Mooslim led? To be sure, this is a very inconvenient truth for those casting most Mooslims as moderate, peace-loving victims and only those committing violent acts as extremists. But that’s all part of the international deception. The reality is that ALL Mooslims are commanded to become Qu’ran obeying, Mosque attending, Imam trained savages employing egregious acts of barbarism in the propagation of Islam just like their prophet Muhammad did! Islam is couched as a “religion.” It is not. It is an Anti-Christ, Anti-Semitic Fascist political Beast intent on re-establishing the Byzantine caliphate that ruled one-thousand years after the collapse of Western Rome; all done by following the teachings from the Qu’ran that command Mooslims to slaughter all who won’t convert to Islam: “Fighting [which means “killing” in Arabic] is obligatory for you, though you dislike it.” [Sura 2:126]. “I shall cast terror into the hearts of the disbelievers. Cut off their heads, and cut off their limbs.” [Sura 8:12]. With the Qu’ran as its guide, is it any wonder most of the violent uprisings around the world are Mooslim led? To be sure, this is a very inconvenient truth for those casting most Mooslims as moderate, peace-loving victims and only those committing violent acts as extremists. But that’s all part of the international deception. The reality is that ALL Mooslims are commanded to become Qu’ran obeying, Mosque attending, Imam trained savages employing egregious acts of barbarism in the propagation of Islam just like their prophet Muhammad did! Rev_13:12 And he exerciseth all the power of the first beast before him, and causeth the earth and them which dwell therein to worship the first beast, whose deadly wound was healed. Rev_13:15 And he had power to give life unto the image of the beast, that the image of the beast should both speak, and cause that as many as would not worship the image of the beast should be killed. The root cause of terrorism in Islam is the Qur’an which teaches: “Fighting is obligatory for you, though you dislike it.” [Sura 2:126]. The word in Arabic for fighting means “to kill.” And it says also “I shall cast terror into the hearts of the disbelievers. Cut off their heads, and cut off their limbs.” [Sura 8:12]. Today, the Arab Spring has become the world’s Islamic nightmare! The inconvenient truth for all those desperately trying to hide the atrocities of Mooslims is simple: Most of the violent uprisings around the world are Mooslim led as inspired and directed by allah in the Qu’ran. Winston Churchill once remarked: “Most people, sometime in their lives, stumble across the truth. Most jump up, brush themselves off, and hurry on about their business as if nothing had happened.” I hope you won’t do that with this warning about the Islamic caliphate now forming around the world. Pray and protest against colonizing Islamists and the evil occupant in the WH financing and promoting them!